The headline really says it all, folks. 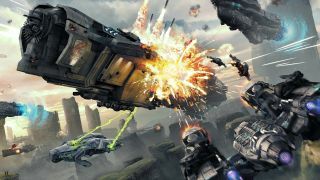 We've got oodles of codes for the spaceship combat game Dreadnought - now in beta on PS4 - and we want you to have 'em. Just fill out the form below and be sent your golden ticket to boomtown. Please note: these codes are only redeemable in the EU region. If you've not heard of Dreadnought before, here's the skinny. As a feared mercenary fighting across the galaxy for glory and credits, you'll pilot one of 50+ ships in 8v8 battles. Said ships are spread across five categories: heavy, assault, sniper, support, and scout. Bigger ships deal more damage, but are harder to maneuver. Smaller ships are more agile, but can be vaporized quickly. Now get out there and blow something up.